Hello again my crafty friend, it’s time for day 2 of The Rabbit Hole Designs new release blog hop and I’m so excited to show you this sweet new set! They are doing things a little different this time around. Instead of teasing you with stamp sets you can’t buy until the end of the blog hop, they are available right now!!! 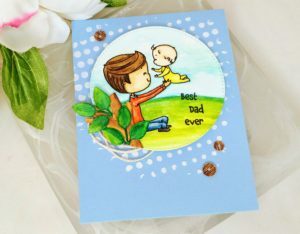 Today I’m sharing a couple of cards I made with the brand new We Are Family set. 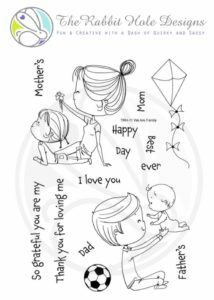 I made Mother’s Day and Father’s Day cards, but these stamps have a variety of mix & match sentiments that can be used for lots of different cards or scrapbook layouts. Isn’t this set so cute? It makes me feel cuddly inside. And the kite and soccer ball are perfect for creating park scenes. You can even mix sentiments from yesterday’s featured set, Happily Ever After, with these images as well. 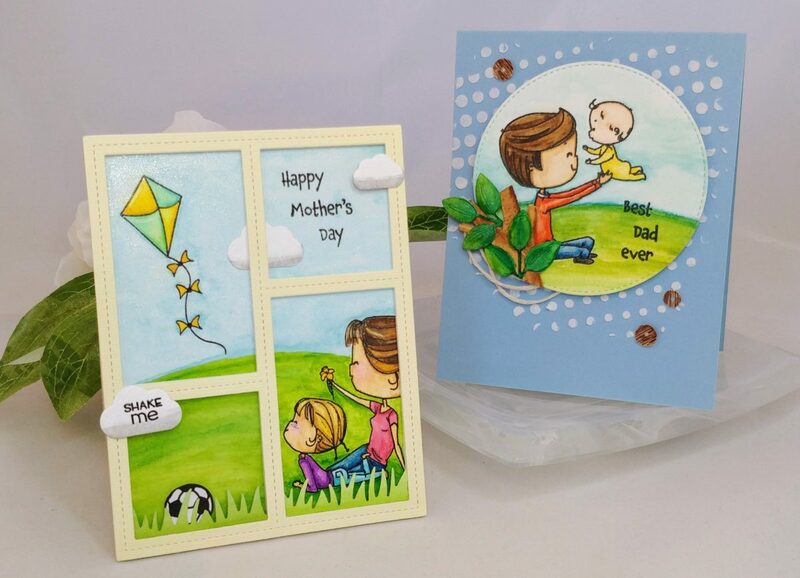 Since Mother’s Day is first (May 12th in the US this year), I’ll tell you how I made that card first. Still in a shaker mood from yesterday, I turned this card into a shaker card too! Instead of adding lots of filler though, I opted to only add a soccer ball behind the window and let it bounce around. To both pop it up, and help the ball move around a little easier, I backed it with a thin piece of fun foam. That allows it to slide smoothly over the background and adds a little more weight to the ball. 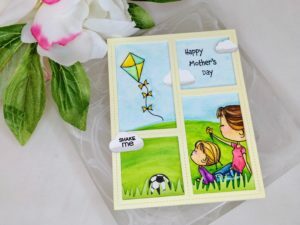 The card was created by stamping my images and sentiment onto mixed media paper, then embossing them, and watercoloring them. I also painted in a green hill and blue sky behind the scene. I stamped and embossed the soccer ball separately and cut it out. If you look closely, there is a slight grey line colored partway around the edge; this gives the ball a little more dimension. I die cut the frame several times, along with several clouds, and a strip of grass. When assembling the frame layers, I put the yellow layer on top, acetate over the one window, grass along the bottom, then the next few layers of frames, with the a cloud half way through the stack, so it would have a little dimension too. I planned to add a little shimmer to the kite and the girls’ cheeks, but the pen dripped so I ended up just applying it to the whole sky, and I think I like it better that way. I finished the card with another set of clouds on top, one stamped “shake me” so the recipient knows to play with it. My Father’s Day (June 16th in the US) card isn’t interactive, but I added a lot of texture and interest, so I’m pretty sure Dad will love it! My scene was stamped, embossed, and watercolored just like the first card. Then I cut it out with a stitched circle die. I also die cut a few tree limbs and leaves, and painted them in as well. To add texture to my blue card base, I stenciled on some light molding paste. Once everything was dry, I glued the tree limbs and leaves to the scene, popping some parts up with foam tape. I wound up a bit of twine and glued it to the card base so a little would be exposed when the scene was in place. To help the scene pop up, I backed it with a thin layer of fun foam, then glued it down. Since this is a Father’s Day card, I didn’t add any glitter, but I still wanted a little bit of bling, so I glued on some wood grain sequins. To celebrate day 2 of the release, The Rabbit Hole Designs is giving away the stamp set We Are Family to one lucky winner. Winner will be chosen at random from the comments left on participating blogs, so make sure to visit each stop and leave a comment. Leave comments by 11:59 pm PST 03-28-2019 on all participating blogs. Winner will be announced on The Rabbit Hole Designs blog 03-29-2019. Oh my that soccer ball, it’s just too cute! You are a card making engineer! Oh these are so super cute! Wow! Another shaker! 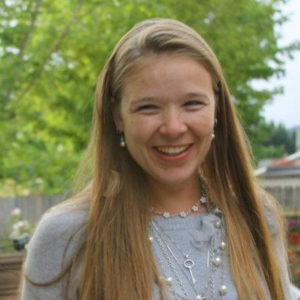 Love your cards, Amanda! So cute! How darling is that scene with the ball moving, wow sooo creative. Boyh cards are awesomeness!! Your grass steals the show. I love the hill, with the nicely colored grass. GREAT scenes. Such a sweet set! I LOVE how you created little scenes and great coloring! Simply darling! I have a soon to be 2 year old granddaughter and her brother is arriving in May. These remind me so much of her! Gorgeous card! Love the pretty details and your background! Beautiful cards! I love how creative you are! The ball left to bounce is a brilliant idea! lOVE! Oh my!!! I’m totally in love for your super cutie cards!!! So cute, I really love this new set and how you used it! Oh my, I just saw this on IG and I LOVE your cards so much! This set is adorable as is, but with your creative touch – it’s magical! Thank you for the inspiration! Awesome card! I love the frame effect. Both of your scenes are adorable. It’s so easy to mix and match the elements and your coloring is lovely. Sweet cards with this adorable set!